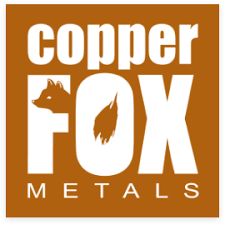 Copper Fox Metals Inc. (TSX-V: CUU) (OTC Pink: CPFXF) and its wholly owned subsidiary, Desert Fox Copper Inc. are pleased to announce additional analytical results from the Van Dyke oxide copper deposit (see news release January 23, 2019). Van Dyke is an In-Situ Leach project where the commodity of interest is acid soluble copper. DDH-OXY-10 returned an average of 0.748% ASCu over a 40.84m core interval including a 12.50m interval grading 2.253%ASCu. The four drill holes yielded increased weighted average ASCu concentrations of 16% compared to the original database. The four drill holes yielded an average 20% increase in the thickness of the mineralized intervals compared to the original database. The percentage ASCu/TCu is 30.7% higher in 2019 versus the original analytical results. The mineralized intervals in the four drill holes reported are open and additional sampling is required. TCu= total copper, (%) = percent, (m) = meters, ASCu = acid soluble copper, the above mineralized intervals do not represent true widths. The original Total Copper (TCu) concentrations reported in the project data base show a good correlation with the 2019 results. The following table shows the comparison of the ASCu concentrations and thickness of the mineralized intervals for the four holes reported in this news release. Copper Fox is a Tier 1 Canadian resource company listed on the TSX Venture Exchange focused on copper exploration and development in Canada and the United States. The principal assets of Copper Fox and its wholly owned Canadian and United States subsidiaries, being Northern Fox Copper Inc. and Desert Fox Copper Inc., are the 25% interest in the Schaft Creek Joint Venture with Teck Resources Limited on the Schaft Creek copper-gold-molybdenum-silver project located in northwestern British Columbia and a 100% ownership of the Van Dyke oxide copper project located in Miami, Arizona.